When your Baby finally drifts off to sleep, it is one of the greatest moments of your parenting life, right? The only problem is, sometimes it is a challenge to settle a Baby! Thankfully, there are many tools we can use as parents to help us get some adult time back. 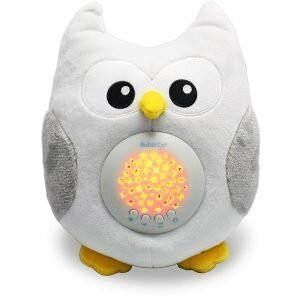 I have already taken a look at one particular sleep inducing tool (night light projectors), and here I take a look at the best white noise sound machines for Babies! White Noise – Is It Good For Getting A Baby To Sleep? Simply answer – yes, a white noise machine is an excellent tool for getting your Baby to sleep, especially if your Baby suffers from colic. In another trial, 80% of Babies fell asleep within 5 minutes of listening to white noise. I am not sure about you, but I would take those odds at 3am! The Bubzi White Noise machine is an awesome choice to help get your Baby to sleep! The Bubzi has 10 relaxing songs, along with heartbeat, and bird songs. Songs include: Minuet, Brahms Lullaby, Mary Had a Little Lamb, Hush Little Baby, and others. 30-minute auto shut-off ensures that you do not disturb your Babies sleep. 3 x AAA batteries, which means the Bubzi is totally portable and can be used wherever you need to use it. The Bubzi is extremely well made! Like any cuddly toy, it is made to be comfortable enough for your Baby to hug it. The cuddly toy can be cleaned easily by removing the sound and visual unit before hand washing the cuddly toy. Always use cold water. Any visuals are excellent tools to distract your Baby. The Bubzi has a star projector unit, which will keep your Baby entertained while the while noise soothes them to sleep. You can adjust the volume by choosing one of the 4 volume levels. The maximum volume is a little too loud if you plan to keep the Bubzi in your Babies crib. Included with the Bubzi white noise machine is an adjustable strap, which allows you to attach it anywhere in your Babies crib. Always be careful when attaching anything in your Babies crib. When they are not very agile, it is fine. But, when your Baby is able to move around and reach out to grab things then you should remove anything that may be dangerous, such as any cords. When your Baby is agile, simply remove the strap and give them Bubzi to hold onto. Buying the Bubzi White Noise machine helps Moms overcome postpartum depression. Each purchase will include a donation to Postpartum Support International. An awesome contribution to an excellent cause! The Marpac Hushh if a highly rated white noise machine! There are 3 sounds, gentle surf, bright white noise, and deep white noise. There is no auto shut-off functionality with the Marpac Hushh, which is slightly disappointing, but if you are going to be awake until your Baby is asleep, then you can always switch it off manually. I recommend that you do not leave it on all night, or throughout your Babies sleep during the day. The Hushh is powered by a lithium battery, which is charged via a USB cable. You can also use the unit whilst it is plugged in. The Hushh is very durable with strong build quality. It feels like it can accept a few knocks, but I would not go overboard! Along with the excellent, calming sounds of the Hushh, it also has an ambient LED nightlight. Awesome to keep your Baby entertained, but will also help to stop you tripping over things when it is dark! The volume settings range from 0dB to 85dB. I recommend that you do not set this unit over 50dB if you are going to place it close to your Baby. A great feature of the Hushh is the child lock. As you can hang the Hushh in the crib, it is vital that you can lock the settings to stop little hands turning the volume up and down. 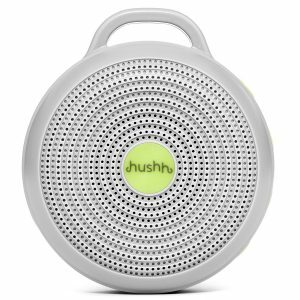 Also – the Hushh has a strap which allows you to attach the white noise machine anywhere in the crib. Please remove this strap, or place outside of the crib when your Baby is old enough to reach out and grab objects. You will also be pleased to know that the Hushh is backed up by a 12-month warranty! 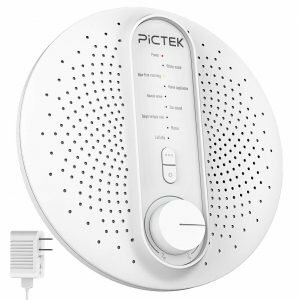 The Pictek white noise machine has 24 soothing sounds, and auto shut off! The Pictek has a vast array of sounds to choose from. You can select 24 of them, including white noise, lullabies, rain, zoo sounds, home appliances, and ocean sounds. There are 3 options available. Auto shut-off can be set to 30 minutes, 60 minutes, and also can be set to stay on all night (not recommended). You can either plug in the white noise machine, or you can power it with 4 x AA batteries. Hardened design, but light. Perfect for travel. Variable volume control can be set from off to loud. As I have already mentioned, the recommendation is that you do not set the volume greater than 50dB. The Pictek has a headphone adapter. Although using headphones is not a great idea on a Baby, it does give you the option to plug in a better quality speaker if you need to. An 18-month warranty and 45-day money back guarantee come with the Pictek. The Baby shusher really is a miracle when you need to get your Baby to sleep! Unlike all the other options on this page, the Baby Shusher only has only one sound, and that is a real voice continually shushing! We all know that shushing will soother a Baby, so why not leave that job to technology? The Shusher has a 15 minute, and 30-minute auto shut-off. Portable, but be careful when handling the shusher. It can break easily if it falls onto a hard surface. Volume control, with a max volume of 85dB. 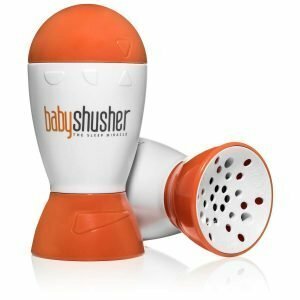 The manufacturer’s recommendation is that you start the shusher at a volume loud enough to get your Babies attention, then turn the volume down as your Baby becomes more relaxed. The Baby Shusher is made with BPA free materials. You will also be pleased to know that the Baby Shusher is backed by a 12-month limited warranty. Adaptive Sound Technology has created an awesome white noise machine that will send your Baby off to sleep! Ambient fan noise can reduce the risk of SIDS. 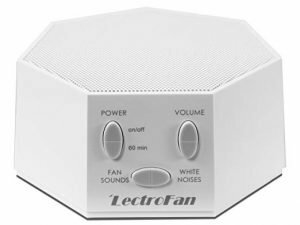 With that in mind, you will be pleased to learn that the LecroFan has 10 fan sounds and 10 ambient noise selections. White noise, pink noise, and brown noise. White noise is intense, like static or an untuned TV. Pink noise is less harsh than white noise, and the intensity drops as the frequency increases. Brown noise is very much like rushing water, or strong wind. The LectroFan has a 60-minute auto shut-off. You can power the LectroFan with a USB cable or an AC adaptor. The LectroFan has excellent build quality! Some of the options on this page are built to be added to your Babies crib, but the LectroFan is not. You can control the volume with a dial, which means you can set the volume at a level that you and your Baby is comfortable with. It is important to remember that you should not set your white noise machine louder than 50dB if it is going to be placed near your Babies crib. The LectroFan comes in 3 styles, and 5 colors. Also, the LectroFan is backed by a 12-month limited warranty, giving you peace of mind! Place the white noise machine at least 7 ft away from your Baby. The sound should not exceed 50dB. Always use a timer! As tempting as it is, do not leave the white noise machine on throughout your Babies sleep because it could lead to sleep disturbance. Use white noise to get your Baby to sleep, but switch it off shortly afterward. Use sparingly – do not use every night, or it will become difficult to get your Baby to sleep without one! If you are looking for a white noise machine for your Baby, then any of the options on this page are excellent! Details given in this post are for guidance only. White noise machines can be an awesome way to sending your Baby off to sleep, but you should always carefully consider other options too, such as a Baby night light projector! When I have struggled to get my Baby to sleep in the past, I have used white noise, night light projectors, and if none of those options work, then it is a short drive in the car and he fell asleep within minutes! Research has also shown that ambient fan noise can reduce the risk of SIDS, which is another great reason to use white noise to get your Baby to sleep.